Traditional Southern Old Time fiddle music with a great groove. Drawing from a wide range of musical influences, Bittersweet plays an eclectic mix of songs from country, folk, old-time, blues, and rock -- Americana. 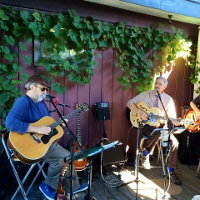 BLUE SKIES is known for their acoustic interpretations of vintage jazz & blues standards. A string band featuring banjo, fiddle, guitar, and bass. We're a string band with a leg up on Old Time music. The Sugarlumps dive deep into American musical history during the time that it was taking form. Their songs are a diverse mix of blues, rural country blues, jazz and ragtime from the 1920's through the 1940's. Whippoorwillow plays original music, bluegrass staples, and songs from a variety of genres in the bluegrass style.